Another strong contingent, with MH joining L and M at Penhelig station. We’re heading to Tal-y-bont, up the coast. The north wind still blows, so we plan a southerly walk to Fairbourne today. It’s not just windy, it’s cold, and we can see snow on the mountain tops. Tal-y-bont turns out to be disappointing – no cafe, no shop – and we’re deprived of our usual initial coffee-and-sugar stimulus. The path takes a roundabout course out of the village, through a succession of fields. 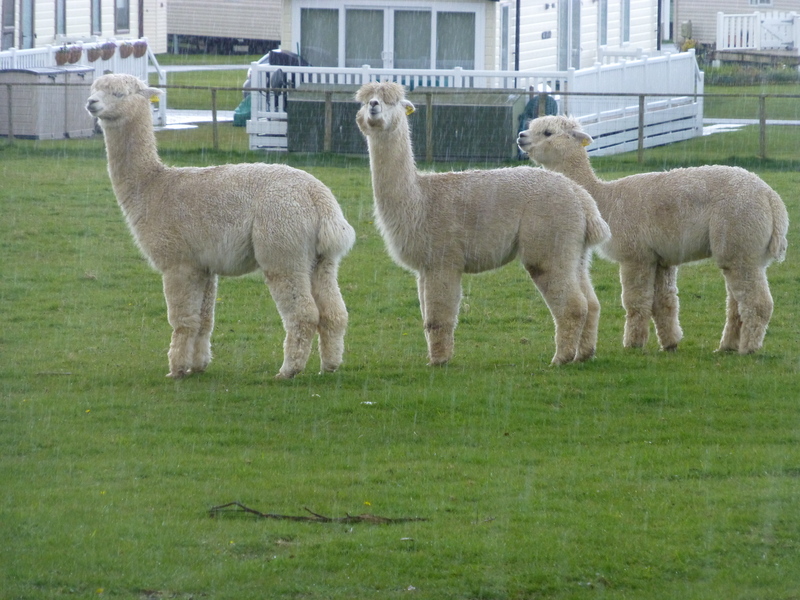 One of them contains three alpacas, gracious creatures who approach us in a leisurely way and exchange a few polite words. Just as we lose our way in another group of fields, the rain starts to come down. There’s no worse Coast Path experience than being lost and wet, but now it’s sleeting, ice is bouncing off the map and guidebook. We manage to get back to the main road and begin a long, two and a half mile trek along the pavement, fast vehicles swirling past us as we stride along, heads down, hoods up. There’s no much to see, except a boarded-up Sunday School, and endless stone walls lining the sloping hills to our left. At least we’re comforted by the home-made flapjacks L has brought for us. They score very highly on the Coast Path flapjack index. The Coast Path authorities score zero for route planning. Llanaber is the next village. Its church sits just off the road on the right, slate gravestones wet in the grey light, but this is a straggly village, and it’s another half mile before we can finally turn off the main road and join the end of Barmouth Prom to take us into the town. A series of dark groynes punctuates the coast here. At least the weather is improving, and the rain has stopped. 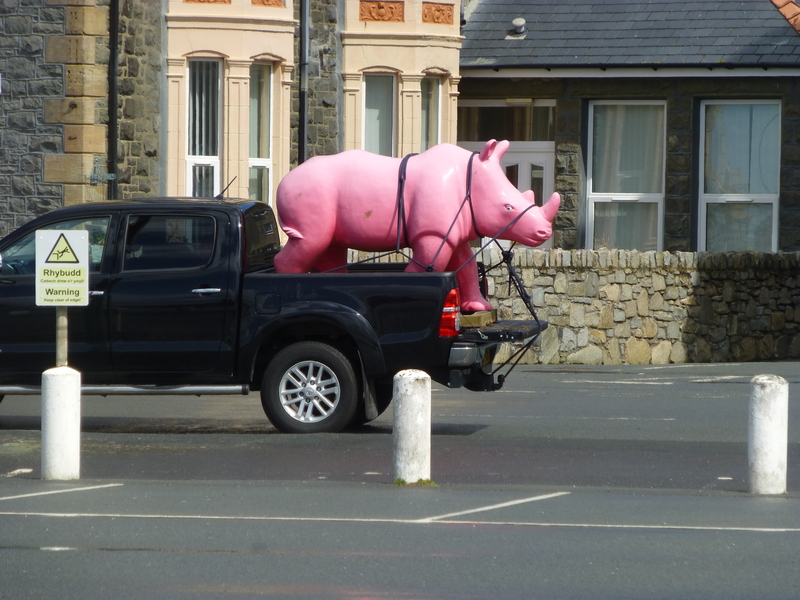 Barmouth is a town that has no truck with tastefulness, and it’s no surprise to see a pink rhinoceros riding on the back of a van on the walk in. The architecture of the town centre is rugged and strong, if you lift your eyes above ground level, but almost every other building, including many former chapels, seems to be an antique or junk shop. We stop for lunch in a cheerful café with slow service, and march on towards Barmouth’s great glory, the bridge across the Mawddach estuary. The same Gwynedd Council who decided to abandon Fairbourne to the waves (what do they have against this part of their empire?) also proposed to close Barmouth Bridge to pedestrians and cyclists, to save money. A loud protest resulted, and the decision was rescinded. A surer way of destroying Barmouth’s tourist industry it would be hard to think of. We walk across on the wooden decking. It takes ten minutes and feels like being in a French film. The weather has brightened, in some parts of the sky, and visibility is better. There are strong contrasts of light and shade as the eye passes from one side of the estuary to the other. Near to us are dark rain clouds, but further east there’s a warmer light. In the distance ahead, covered in snow, lies the summit of Cadair Idris. 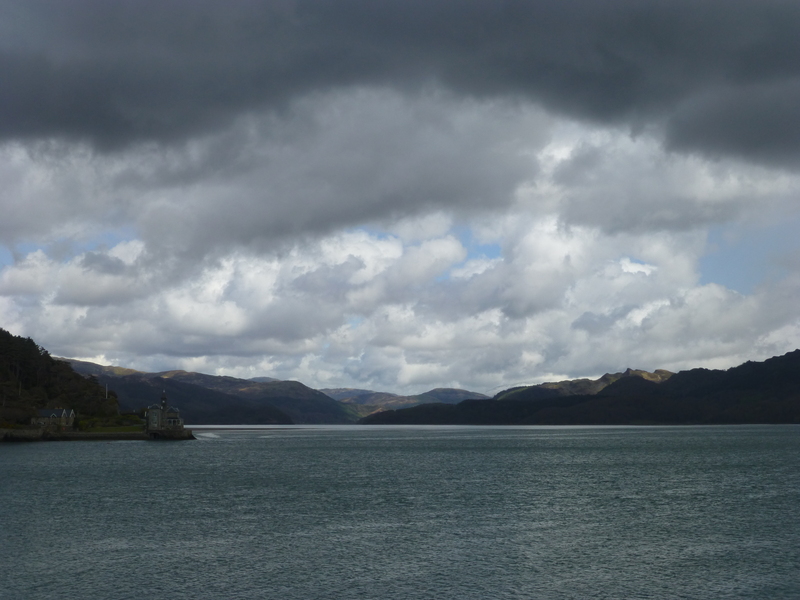 The grand flow of the Mawddach eases down to us from among its enclosing mountains. It’s impossible now to gain any idea that this river valley once teemed with people and industry: mines studded the hillsides and ships were built on the shores, while a railway linked Dolgellau with Barmouth on the southern bank. Now the whole flooded valley has reverted to its pre-modern past, a quiet and remote corner of Wales. This view of the Mawddach is surely one of the great highlights of the Wales Coast Path. At Morfa Mawddach we leave the railway and follow a raised track west towards Fairbourne. The north wind whips across our faces, and there’s no shelter. 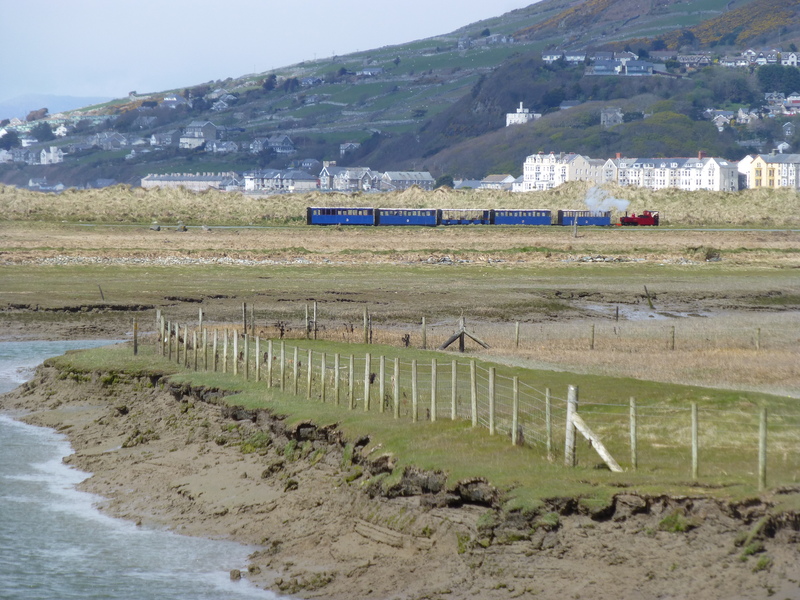 In the distance the Fairbourne Railway train puffs slowly along towards the estuary, without passengers. Nearer the village some hardy people are playing golf (MH tells us it’s not one of the premier courses). Then past the ‘dragon’s teeth’ and the doomed bungalows, to the station to wait for the train back to Aberdyfi. Opposite the station are some terraced shops. Somehow they remind us of the Wild West; it wouldn’t surprise us to see the town sheriff arrive and tie his horse to the railing outside one of them. On the train is another Outward Bound group, this time of girls. They look as disaffected as the boys we saw yesterday on the Penhelig station platform.